UPDATE (20 Feb 2011): EURO-DNA-CALC has been superseded by the Dodecad Ancestry Project. The current version is 1.1.1 Download it if you obtained previous version (1.1) which had a bug for deCODEme data. A new version of the EURO-DNA-CALC has been released. The previous version (1.0) was described here. Version 1.1 also uses deCODEme/23andMe data for an individual but outputs a maximum likelihood estimate of his admixture proportions from the three groups NW European, SE European, and Ashkenazi Jewish. More comments on this dna-forums thread (registration required). Below are the admixture estimates for Greg and Lily Mendel of 23andMe. An examination of the confidence intervals output by the program suggests that non-NW European admixture in Greg is a strong possibility, while Lily could conceivably have no non-NW European admixture. 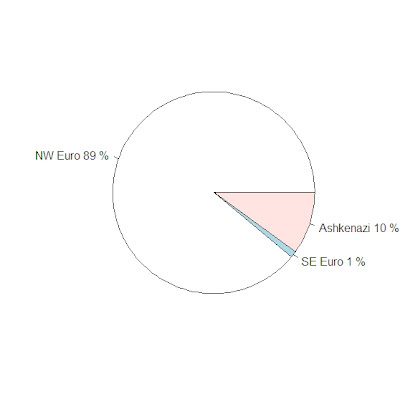 On the other hand, Lily's 10% Ashkenazi and only 1% SE European admixture imbalance is interesting. As with all genetic tools, the results should be interpreted in the light of other information about a person's ethnic origin and genealogy. Thanks for the new version. I get 9 NW, 91 SW and 0 AS. Being from Italy (tuscany), that seems on the mark. Which algorithm are you using now? Just an exhaustive search over all possible admixture estimates (x,y,z) where x,y,z>=0 and x+y+z=100. If NW,SE,AJ are the frequencies of an allele in the three populations, then an (x,y,z) admixed individual will possess the allele with probability (x*NW+y*SE+z*AJ)/100. Dinekes, I've added your tool to the genomics secondary market database. What is your full name so that I may credit you with authorship, or if you would prefer an alias, under what name may I list you? Does this apply to 23andme v2, or does it only work with v1? It should work fine with v2. "NORTHWEST EURO: Maximum Likelihood Estimate=100% Interval=[86, 100]"
 "SOUTHEAST EURO: Maximum Likelihood Estimate=0% Interval=[0, 14]"
 "ASHKENAZI JEWISH: Maximum Likelihood Estimate=0% Interval=[0, 9]"
I`m of african-American with multi-mixtures back ground. I would like to find out my European origin, so would the Euro-calu 1.1 works for some like me with only 19%European and 10% asian DNA ? I`m currently uses DNA Tribes, FamilyTree DNA & 23andMe.If not, could you please point me some web sites where i might recieve such information. Thank you. I have no know Jews, Ashkenazim or otherwise in my family going back as far as I have checked,which is 1500s. Speaking of Jews, in my country of origin, Sephardic Jews were present not Ashkenazim. Who are the SE Euros and the NW Euros? I am not of Greek descent. NWE and AJ confidence intervals interesect 0% so I wouldn't give them any particular importance. I ran my dna file from 23andme thru your calc program. My father is from Germany and and far as I know he is not Jewish. and my mothers father ancestors have been here for hundreds of years with a little native american and african in the mix (1/2 % each). My question is, is it accurate that I am really 20% Jewish? You should look at the confidence intervals and not just the central estimates. Both the minor components have probably intervals that intersect zero. "NORTHWEST EURO: Maximum Likelihood Estimate=65% Interval=[38, 89]"
 "SOUTHEAST EURO: Maximum Likelihood Estimate=15% Interval=[0, 52]"
 "ASHKENAZI JEWISH: Maximum Likelihood Estimate=20% Interval=[0, 42]"
As I said, my father is from Germany and my mother is half Romanian and the other half mostly European from the UK. Can you explain what the Intervals mean? Am I 20% Jewish? It doesn't seem to work for me whenever. I have followed every instruction, up until the part where you open the 23andme txt file on the command prompt. cannot open file '23andme.txt': No such file or directory"
Is there any way to reverse-engineer the Frankish-Byzantine-Levantine components from one's "Global Similarity" scores in 23andMe? I'm trying to figure out a multiple-regression set up with the use of many people's results. Error: unexpected symbol in "23andme"
I'm also African American and no it does not work. It shows me to be 64% Southeast European, 0% Northwest European, and 36% Ash. Jew. LOL This does not at all coincide with 23&me, they say I'm at least 62% African, but likely more because they have serious issues overestimating "Asian" (really Native American) ancestry in New World Blacks. 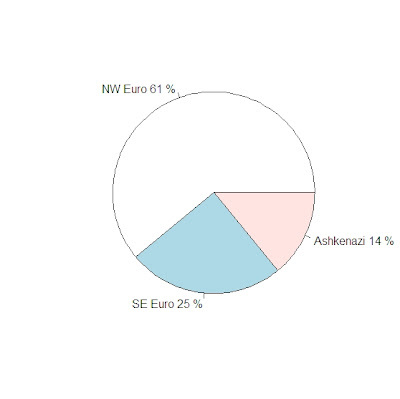 My Central European girlfriend is shown as having 21% Ash Jew, 40% NW Euro, 39% SE Euro. Based on where she is from and her families name and known time in the area I doubt she has any Jewish ancestry that is in the last 200-300 years anyway...the location of her country makes it typical that she would come out as an even split between NW and SE...so with that it appears accurate and matches up with 23&me fairly well as she is almost equally related to Southern and Northern Europeans. "NORTHWEST EURO: Maximum Likelihood Estimate=45% Interval=[17, 67]"
 "SOUTHEAST EURO: Maximum Likelihood Estimate=7% Interval=[0, 45]"
 "ASHKENAZI JEWISH: Maximum Likelihood Estimate=48% Interval=[23, 69]"
On ne peut rien vous cacher. Merci et bonne poursuite de votre superbe travail. Some surprise given that most of my known DNA comes from Romania, in spite of some German blood; however, my Y-DNA haplogroup is U106+ L48+ L47- L148-. No surprise here, with all known ancestry being overwhelmingly French, with a little English, as well. Those Europeans baffled by indications of Jewish roots should keep in mind that the early church was populated almost exclusively by Jews, who reached out to their pagan Gentile neighbors and included them in the church. Their children, raised in the same faith, naturally intermarried and with each generation the Jewish genes were spread wider, so I would estimate all Europeans have at least some Jewish roots. The Jews were a small part of the Roman Empire, so even if they were ALL of Jewish origin, and had ALL converted to Christianity, and ALL their genes had spread uniformly across Europe, it would amount to a few % at most, spread evenly across Europe. ctuemmler, I've ran EURO-DNA-CALC on both Win7 and XP without a problem. The only thing I can think of is to perhaps install the 64bit version of R if you are running a 64bit operating system. "NORTHWEST EURO: Maximum Likelihood Estimate=0% Interval=[0, 10]"
 "SOUTHEAST EURO: Maximum Likelihood Estimate=56% Interval=[32, 80]"
 "ASHKENAZI JEWISH: Maximum Likelihood Estimate=44% Interval=[20, 68]"
 "NORTHWEST EURO: Maximum Likelihood Estimate=0% Interval=[0, 18]"
 "SOUTHEAST EURO: Maximum Likelihood Estimate=84% Interval=[57, 100]"
 "ASHKENAZI JEWISH: Maximum Likelihood Estimate=16% Interval=[0, 41]"
Considering that we only about 57-58% European, do this mean that my sister are I are about 25% Ashkenazi Jewish (58 x .44), whereas our mother is about 9% Ashkenazi Jewish (57 x .16)? This test is meant for Europeans only; non-Europeans will still get 3 numbers that add up to 100%, but they are meaningless. I tried to use the calculator on my 23andme results and it is giving me an error. Any thoughts as to the cause? my wife is of iraqi Jewish descent on both sides. her EuroDNACalc results were as follows: "NORTHWEST EURO: Maximum Likelihood Estimate=0% Interval=[0, 22]"
 "SOUTHEAST EURO: Maximum Likelihood Estimate=42% Interval=[13, 64]"
 "ASHKENAZI JEWISH: Maximum Likelihood Estimate=58% Interval=[36, 80]"
Does this mean that she is likely at least 36% Ashkenazi, or does it mean that of her European DNA (excluding her Iraqi/Near Eastern DNA), she is at least 36% Ashkenazi? Put another way (1) does EURODNACALC only count your European DNA strands; and (2) is Near Eastern/Middle Eastern DNA considered "European" for these purposes? "NORTHWEST EURO: Maximum Likelihood Estimate=0% Interval=[0, 8]"
 "SOUTHEAST EURO: Maximum Likelihood Estimate=8% Interval=[0, 30]"
 "ASHKENAZI JEWISH: Maximum Likelihood Estimate=92% Interval=[70, 100]"
I'd like to submit to DODECAD, but I understand that its closed. Is the calculator working with 23andme V3 chip results? I have both V2 and V3 data and I am getting different results. In change dir you are not going to find your data file, you will go to the directory where you saved the '23andme.txt' file. "Error in row.names(B) : object 'X' not found"
What's gone wrong there? Any help is appreciated! Ok I figured it out - all I needed was to change the 23andme data file to 23andme.txt instead of the default name. "NORTHWEST EURO: Maximum Likelihood Estimate=72% Interval=[52, 88]"
 "SOUTHEAST EURO: Maximum Likelihood Estimate=0% Interval=[0, 23]"
 "ASHKENAZI JEWISH: Maximum Likelihood Estimate=28% Interval=[11, 45]"
Does this mean I have Jewish ancestry or do I take the results with a grain of salt? Thanks in advance. Using R 2.13.1 on Linux (Fedora) I had to first load the RData file. "NORTHWEST EURO: Maximum Likelihood Estimate=15% Interval=[0, 42]"
 "SOUTHEAST EURO: Maximum Likelihood Estimate=73% Interval=[38, 100]"
 "ASHKENAZI JEWISH: Maximum Likelihood Estimate=12% Interval=[0, 34]"
Is it still possible to download this? I've tried several times but it says forbidden. How to download this? Need help!